The integration of development and climate objectives is increasingly recognized as significant in research and policy making. In practice, some development aims, such as poverty alleviation, enhancing energy security and access or improving health, also have potential climate benefits. The challenge is to find a broadly applicable range of effective policies and actions that realize development objectives and at the same time result in real climate benefits. This special issue of the Climate Policy journal focuses on new evidence that identifies options for action, examining how development strategies, policies and decisions can be made more sustainable by integrating climate change considerations and overcoming the barriers that hinder implementation. It also explores what lessons exist for policy at the national and international level and looks at how promising options for local policies can be scaled-up through international initiatives. 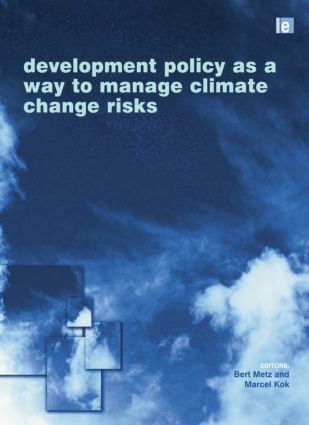 It also examines how international policy frameworks can create the conditions for integrated development and climate policies. The outcomes provide useful contributions to sustainable development planning on issues such as poverty reduction, rural development, disaster preparedness, energy and transport as well as to the discussions at national and international level regarding next steps to deal with climate change. Bert Metz and Marcel Kok are senior researchers at the Netherlands Environmental Assessment Agency in the programme on Global Sustainability. Bert Metz is also co-chairman of the Working Group on Climate Change Mitigation of the UN's Intergovernmental Panel on Climate Change.